I went to London Edge to blog about it and to catch a glimpse of some of my favorite brands new collections! Also, I was lucky to be asked for an interview by a German Radio Channel! Check out the Gallery & if you happen to be a fellow German listen to the Interview here on "Unser Ding"
Back in school, (when I didn't discover the pleasures of online shopping yet) it took me at least one hour by bus & train to get to the next store which sold Iron Fist. Nevertheless it was the best part of the week to go there with my friends and spent my collected lunch-money on a new iron fist tee. You can probably imagine how excited I was to go to the Iron Fist Stall. I almost overdosed on pink cuteness when I saw the My little Pony Handbags and the Pop Art prints, not to mention the iconic Iron Fist Heels and creepers. Damals in der Schule (als ich die Freuden des Online Shoppings noch nicht entdeckt habe) hat es ca. eine Stunde mit dem Bus gedauert um zum naechsten Iron Fist Laden zu kommen. Dennoch war es so ziemlich das coolste mit meinen Freunden dort hin zu fahren um mein gesammeltes Essensgeld fuer ein neues Iron Fist Shirt auszugeben. Ihr koennt euch wahrscheinlich vorstellen wie gluecklich ich darueber war mir ihren Stand anzusehen: Eine Ueberdosis von zuckersuessen pinknen My little Pony Handtaschen und Pop Art Prints. Nicht vergessen: die klassisch gruselig aber niedlichen Heels und Creepers! 2. DISTURBIA CLOTHING - "Occult Grunge"
Actually Disturbia was not one of the brands I was excited to see BUT they really got me with their gorgeous dresses and cool statement shirts. This is pretty much the store that would make Wednesday Adams smile for the first time in her life. My favorite (not a suprise): The "Wednesday" dress with a white Peter Pan collar and a cool pentagram print on the back. Eigentlich war Disturbia nicht gerade eine der Marken auf die ich mich gefreut habe; Aber sie hat es geschafft mich vollkommen zu ueberzeugen mit ihren wundervollen Kleidchen und coolen Statement Shirts! Disturbia ist wohl DER Laden der Wednesday Adams zum ersten Mal in ihrem Leben ein Laecheln auf die Lippen zaubern wuerde! Mein Lieblingsteil (nicht gerade eine Ueberraschung): Das "Wednesday" Kleid mit Peter Pan Kragen und coolem Pentagram Print auf dem Ruecken! Kreepsville 666 Haar - Accesoires sind ein Must-Have fuer jede gruselige kleine Prinzessin! Wer kann schon einer maedchenhaften Schleife mit Blut Spritzern und herausgerissenen Herzen widerstehen?! Eine neue Entdeckung fuer mich sind die riesigen Totenkopf Ketten in knalligen Farben und die dazu passenden Ringe! Mit Kreepsville fuehlt sich einfach jeder Tag an wie Halloween! 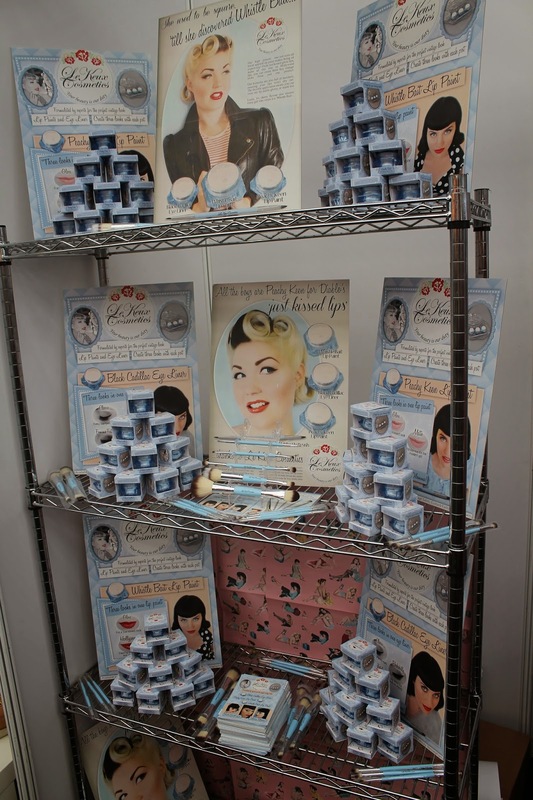 Le Keux Cosmetic are a Vintage Style Cosmetics Company providing make up for Rockabilly babes, Pin Ups, and simply everyone who's born 60 years late! Aren't those oldfashioned pots with the matching brushes lovely?! The best part: They even have their own make up parlours where you can feel like 50s Princess! Le Keux Cosmetics sind eine Vintage Style Kosmetik Firma die Rockabilly babes, Pin Ups und eben alle die dummerweise 60 Jahre zu spaet geboren sind mit Schminke versorgt! Sind diese altmodisch angehauchten Make Up Toepfchen nicht herzalleriebst?! Und das coolste: Sie haben sogar ihre eigenen Kosmetik Salons in denen du dich wie eine 50er Jahre Prinzessin fuehlen kannst! DON'T FORGET TO CHECK OUT MY GALLERIE AND INTERVIEW ON UNSER DING! ugh there are so many great places to shop! these are just photos from a retail exhibition/show though, not proper stores. So cool ! I wish I was There ! I might have gone and booked a both but never had answers too bad ! About my post Thank you very much for this comment and of course if you see something you want on my outfit let me know as I sell stuff on Depop, EBay and sometimes direct to my Readers so dont hésitate. I Will also do some giveaways and There one coming very soon. Oh what a shame :/ it would have been lovely to meet you there!